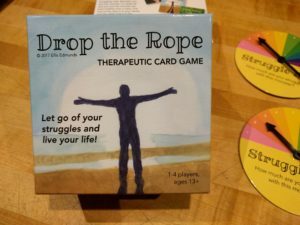 Drop the Rope – Now Available! What do we do when we find ourselves in a struggle? How do we relate to our inner “monsters” that scare us or trigger difficult emotions? In this game, imagine you are in a tug-of-war match with a monster. The monster is something in your life you are struggling with. Between you and the monster is a large pit and you and the monster are both holding onto a rope. One end of the rope is in your hands and the other end is in the monster’s hands. The more you try to pull the monster into the pit, the more the monster pulls back and resists. It feels like an endless struggle of push and pull. Or is it? 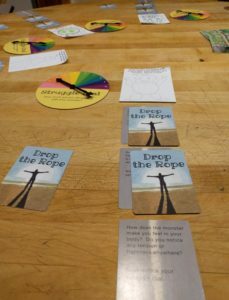 3 Card Decks (Notice the Struggle, Drop the Rope, and Live your Values). 12 cards in each deck for a total of 36 cards. For a chance to win a copy – sign up for my newsletter! 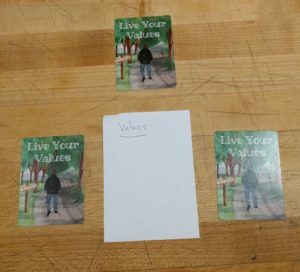 For a shorter game: Use 2 or 1 of each type of card for each player. 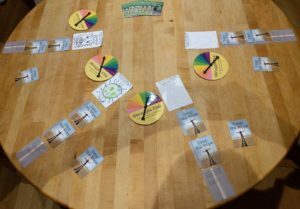 To play with more than 4 people: Each player gets 2 or 1 of each type of card. Additional players create their own struggle dials. 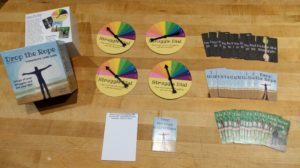 OR – use two copies of the game.